"Through discussion of the geologic history of the region -- and the plants, animals and cultures that evolved from it -- Moskowitz shows how the mountain caribou represents issues facing threatened ecosystems everywhere. He advocates for reevaluating entirely how we conceive of species and ecosystems, to better understand and own our place within them." --Crosscut Caribou Rainforest doesn't tell an easy story, ask easy questions, or pretend that there are easy solutions to the possible extinction of the last mountain caribou herds found in Canada and the United States. There are fewer than twenty animals left in the last US herd. Yet what Caribou Rainforest does--with photographs, words, and science--is explain why this is happening, so that as a community we don't repeat our mistakes, even when our intentions are good. 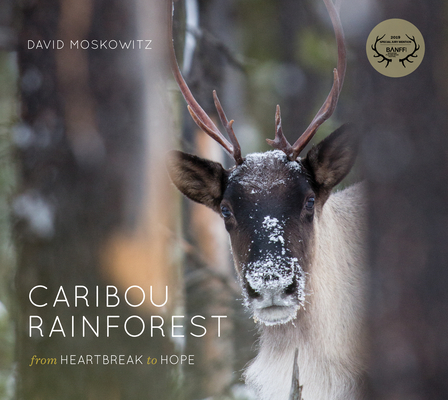 Author David Moskowitz has studied and photographed these caribou extensively in order to understand their plight. He hasn't found villains, but rather climate change, predators, recreationists, settler colonialism, industrial logging, mineral extraction, and a perfect confluence of factors that have worked against this fragile species and the fragile environment upon which it relies. The story of this iconic animal and stunning landscape provides an example of shifting conservation challenges and tactics in the twenty-first century. Mountain caribou have been identified as an "umbrella species" by conservationists, meaning that protecting their habitat also helps preserve many other species who depend on the same ecosystem. The discussion topics are controversial and wrenching--upending the forestry economy of the region, exterminating wolves (who also struggle to survive) to protect the caribou, limiting recreational access to critical habitat, respecting the rights of indigenous peoples. The issues are contentious, but the opportunity to craft solutions still exists. If we do in fact lose the caribou, the task then pivots to how we can protect what remains of this rare rainforest ecosystem. In Caribou Rainforest, the author searches for lessons that can turn despair into hope: their story can become the inspiration and catalyst for committed change.